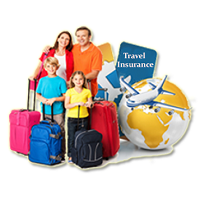 Travel Insurance is one of the most important items that should be in the checklist of any domestic or international tourist while planning a vacation or tour. Located in Pune, Maharashtra, Sixth Sense Holidays is one of the leading tour and travel companies involved in the process of offering genuine and prompt services for availing Travel Insurance at very reasonable charges. By availing the Travel Insurance Services offered by us, one can have the peace of mind and have the most fulfilling travelling experience.